Metso has signed an agreement on a comprehensive valve delivery for Kilpilahti Power Plant in Porvoo, Finland. Metso's valves will be used in conjunction with the power plant's three different boiler units to control the power plant's process flows. Optimally selected, reliable valve solutions enable efficient and safe energy production at low costs and with minimal environmental impacts. The new, combined heat and power plant will generate 450 megawatts of steam and 30 megawatts of electricity. 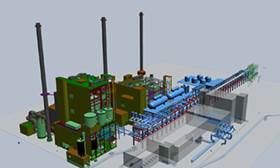 The plant, jointly owned by Neste, Borealis and Veolia, is planned to be commissioned in 2018. The delivery is included in Metso's third quarter 2016 orders received. The value of the order is not disclosed. Metso's valves will be delivered as a part of Valmet Corporation's boiler delivery for the project. "Our control and on-off valves have been on the markets for decades and have proven their reliability in similar power plant projects around the world. We also continuously invest in flow control solutions in power production, a good example being the globe valves we recently introduced for continuous, demanding use," says Metso Flow Control's Jyrki Koskela, Head of Sales and Service, Finland & Baltic Countries. "In power plant applications, durability and reliability are among the most important valve features because unscheduled interruptions in the continuous processes need to be minimal. The Kilpilahti owners are familiar with our valves, as there are plenty of Metso's flow control solutions in use also by Neste's Porvoo oil refinery," Koskela continues. The delivery to Kilpilahti Power Plant will include about 150 on-off and control valves. They represent the newest product versions of Metso's recognized Neles® and Jamesbury product brands. The majority of the valves to be delivered to Kilpilahti Power Plant will be manufactured at Metso's technology and production center in Vantaa, Finland. The unit specializes in designing and implementing demanding valve solutions for the oil and gas industry, among others.